I am trying to figure out what is going on. Our second recognized show for 2018 was in August at Caber Farms in Onalaska. When I signed up for this Horse Trial, I fully expected it to be blazing hot; it is not unusual for south central Washington to be in the 90s that time of year — but it was surprisingly plesant with highs in the 70’s; perfect riding weather! 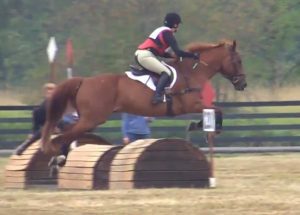 Kip was better on the ground this time, but was very wound up friday morning before our Dressage test. I took him for a walk, and he just got more and more frantic. Ugh. Our test was early, though so I took him out to warmup, and he really calmed right down when he could just be out and about instead of stuck in a stall. The ground was very hard, and the grass on top was very slippery, so I put in studs for all three phases. 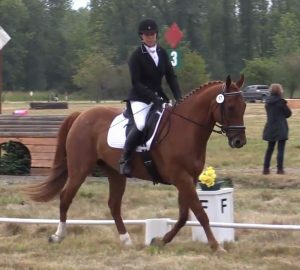 Dressage went great, in fact we got what I think is my best score in competition, a 30.2! Sailing over the last jump. Cross country could not have gone more smoothly. Kip was very forward and eager on course – the only thing he shied at was a damp patch on the ground. Figures. Stadium was on a slope, and again the grass was very slippery, and it made me nervous, so I pulled on him way more than I should have – giving us a 4 point time penalty. I am pretty angry at myself because of this. I need to stay out of his face and let him jump. In spite of my timid ride, Kip earned us a third place ribbon! I was so proud of him. acknowledged the existence, validity, or legality of.